Our intimate gel with cistus is developed for daily gentle care of sensitive intimate areas. We composed it with valued for centuries natural plant ingredients which gently cleanse and soothe the irritations of intimate areas. 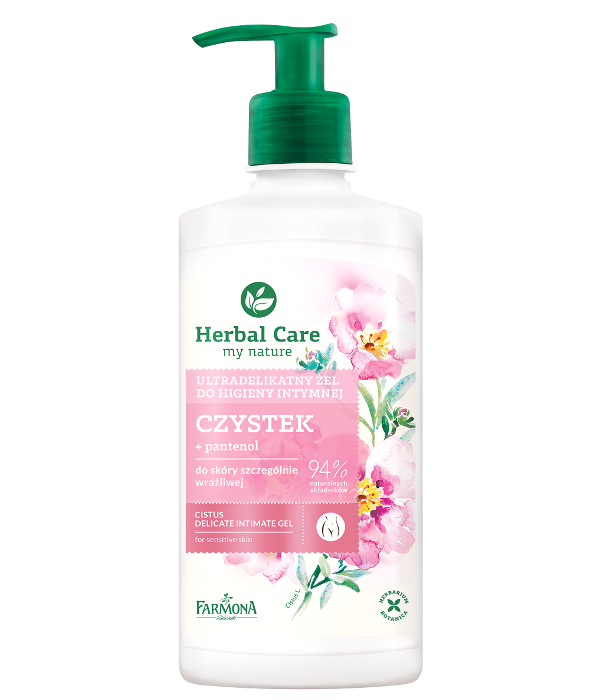 Delicate formula and subtle scent ensures a feeling of freshness and comfort . Pedunculate Oak growths commonly in Poland and Europe. Its bark is very valued and is one of the most popular ingredients made from young trunks and branches. Usage: use a small amount of gel to wash intimate areas then rinse with water. Allantoin – soothes irritations and accelerates regeneration process. Aqua (Water), Glycerin, Cocamidopropyl Betaine, Sodium Cocoamphoacetate, Coco-Glucoside, Glyceryl Oleate, Lactic Acid, Propylene Glycol, Cistus Incanus (Rock Rose) Flower/Leaf/ Stem Extract, Panthenol, Gossypium Herbaceum (Cotton) Seed Extract, Xanthan Gum, Potassium Sorbate, Sodium Benzoate, Hydroxyethylcellulose, Allantoin, Disodium EDTA, CI 17200.